From smartphones, laptops to LED TVs, Xiaomi's list of products is pretty much endless. Now, add an internet browser, called the 'Mint Browser' to this list. 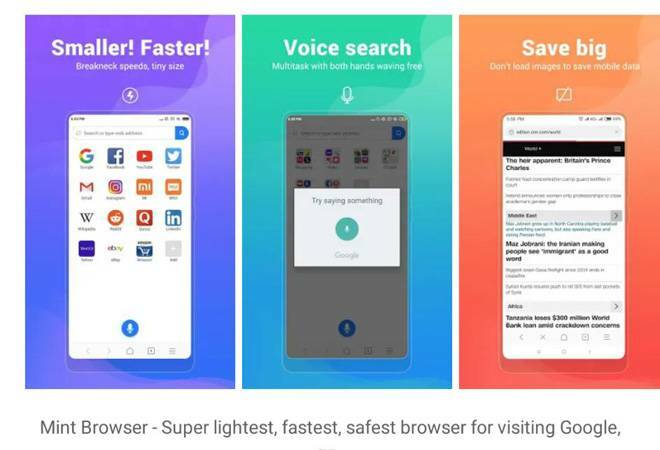 Xiaomi's main purpose behind creating a browsing app is to offer a responsive experience to the owners of underpowered Android phones - especially in the developing markets. Along with options like Chrome, Firefox, Micosoft Edge, Safari, Android users can now add one more option in the form of Mint Browser. The USP of the browser is its low memory and storage requirements. The size of the Mint browser is only 11 MB and it is ad-free. Additionally, Mint Browser manages to pack in most features one could expect from a mobile browser. The browser offers a multi-tabbing web browsing experience alongside providing an Incognito Mode. There is also an inbuilt Dark Mode that inverts the colours of your webpages to provide you with a comfortable web browsing experience under low light. The moment you open the Mint Browser, you are greeted with a list of pre-selected websites. These can be modified and the new ones can be easily added. There is also a search bar where you can pick the search engine you want from the options like Google, Bing etc. Mint Browser renders the web pages quickly and also has an option to minimise the data consumption. Xiaomi has promised to keep Mint Browser as an ad-free offering but going by the company's track record, there are chances that it would introduce some form of ads at an unspecified time in the future. Meanwhile, Google Play has described the app as "one of the best web browsers for Android phones". Xiaomi has said that, with Mint Browser, it has prioritised user experience over pricey specs.